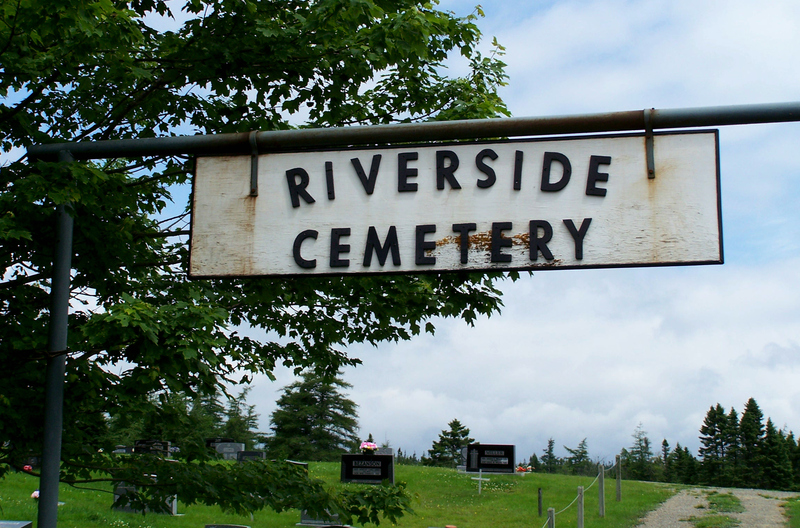 Today I added a page for the Riverside Cemetery in Moser River, Halifax County, NS. This cemetery is large and is located next to the highway, so it is easily found by researchers. To the cemetery page, I added one headstone. 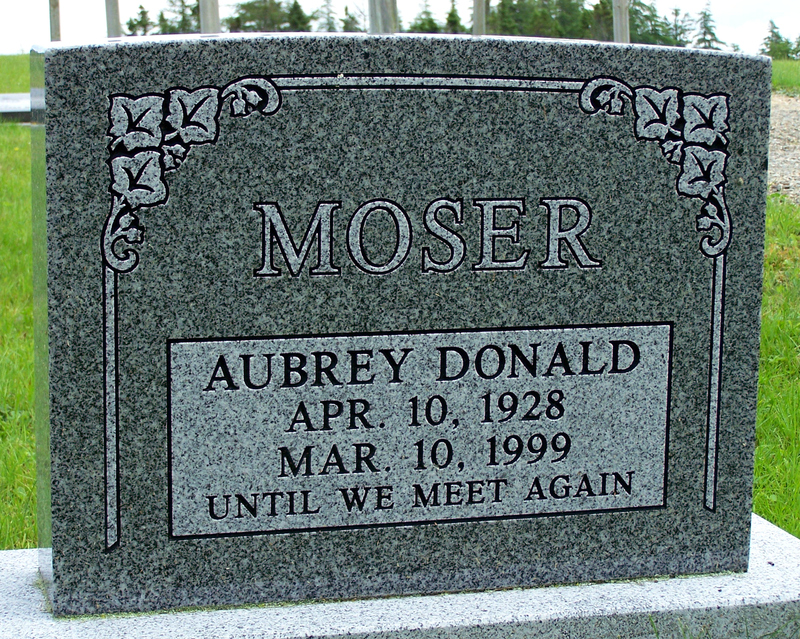 I don’t have any further information on Aubrey Donald Moser, but his obituary appeared in the Chronicle Herald Newspaper, Halifax, NS, on March 12, 1999. I have the Herald Library CD containing obituaries from 1992 to 1999, and the index of obituaries from 1961 to 1992, so when I get a moment, I will find the obituary and post it. His obituary also appeared in the Halifax Daily News on March 13, 1999. Battist, George Frederick: Born: August 30, 1864 at Lower Quoddy, Halifax County, NS, the son of Eliza Turner and John Battist. Moser, Aubrey Donald – Age 70, Halifax, formerly of Moser River, Halifax, County, died Wednesday, 10 March, 1999, in the VG Site, QEII, Halifax. Born in Moser River, Tuesday, 10 April, 1928, he was a son of the late Ernest and Miranda (MacDonald) Moser. He was employed with the Halifax School Board for 23 years until his retirement in 1991. Surviving are stepson, Barry Holman, Dartmouth; brothers, Ronald, Murray “Bud”, Dartmouth; Elmer, Summerside, Prince Edward Island; stepbrothers, Robert Gallant, Prince Edward Island; Elwood Gallant, Ontario; stepsisters, Theresa Ashley, Mildred Arsenault, Prince Edward Island; Reta Gallant, Ontario; step-grandchildren, Mary Jane, Tara, Shawn, Mark; step-great-grandchildren, Haley and Taylor. He was predeceased by his wife, the former Gladys Bezanson; stepmother, Rose Moser; stepbrother, Russell Gallant; stepsister, Doris Moser. Visitation 2:00-4:00 and 7:00-9:00p.m. today in D.S. Crowell & Son Funeral Home, Sheet Harbour. Funeral Service will be Saturday, 13 March, 19999 at 11:00 a.m. in St. Andrew’s United Church, Moser River, Reverend William Bowering officiating. Burial in Riverside Cemetery. Family flowers only. Donations may be made to the Canadian Cancer Society. Thank you, Les, for sharing this obituary.